Having opened earlier this year to much favorable press, there is not a lot left to be said about this petite Pigalle seafood counter serving quality products from suppliers within France (the full list can be found on their online menu). 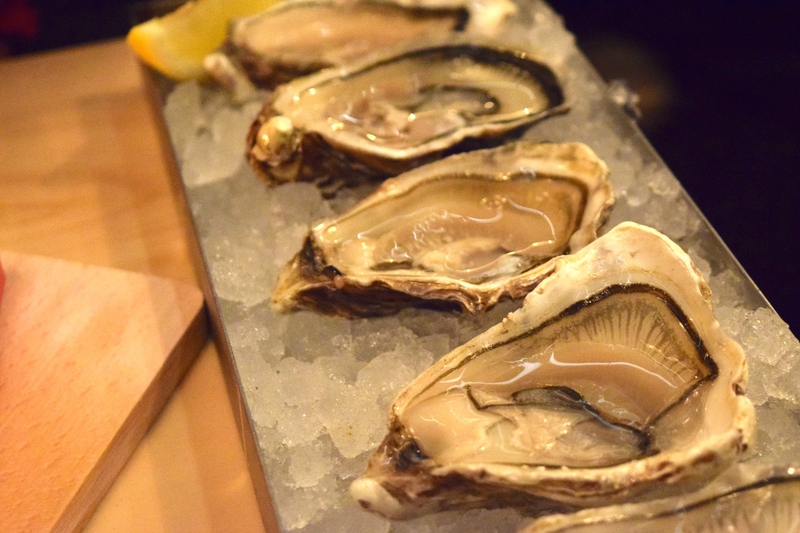 Oysters are most excellent here, but if you tend to avoid them in the “non-R” months, there are plenty of other tasty options from lobster rolls to fish rillettes. I’ve loved everything I’ve tried there and my only “complaint” would be the place is too small, making it harder to score a table here. But frankly, I also love the small size, which makes it feel cozy and a little special, rather than commercial or impersonal. Though they are known for the bivalves, their imbibables warrant attention as well as a good example of how to develop a small and fitting selection of drinks that work well with the food on offer. The menu includes a good selection of wines, artisanal beer, cider and softs. Additionally, there is a very well thought out list of five cocktails conceived by Margot Lecarpeniter (previously of Experimental Cocktail Club and currently behind the bar at Combat in Belleville.) She’s done a very nice job of working a cocktail menu that stays away from the esoteric but still introduces something interesting that – most importantly – works well with most of the dishes. She fittingly selected a newish Normandy aperitif, 30&40, to mix with tonic, which – along with the Sbagliato – will make a lovely starter drink. Otherwise, she’s got three solid classes on the menu with Moscow Mule, Dark & Stormy and a Spritz that pulls in some interesting flavors with Suze and Fino SHerry. All of these are long and sparkling, which, again, makes for a nice pairing with food. This isn’t a full blown cocktail bar where you’ll be going off menu or drinking up and shorts…it’s an excellent example of the continuing trend in Paris for restaurants to institute strong cocktail programs that compliment their dining side rather than compete with it. 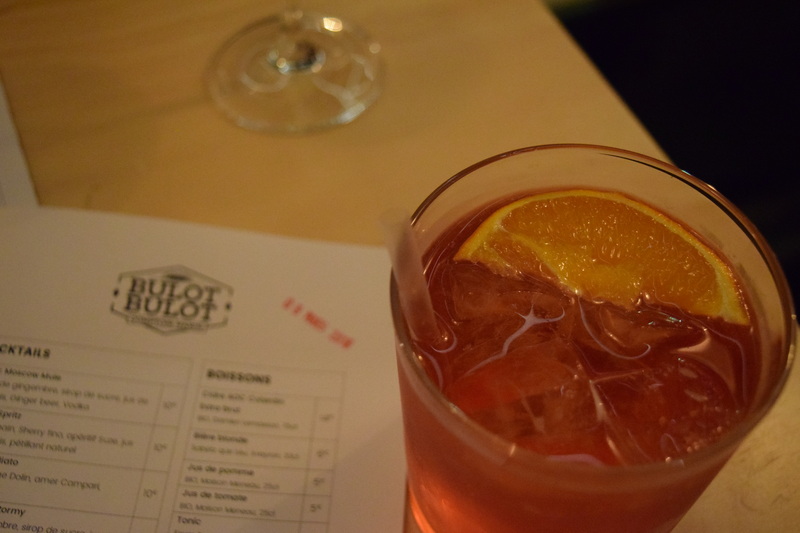 Bulot Bulot hits three hot key words for Paris: cocktails, oysters and Pigalle. But fortunately they’re not just riding on the popularity of these three things. They’re putting quality and effort into the project, which is paying off and making this a very enjoyable spot, indeed.